Colonel Valjean pulled his binoculars over his eyes. No matter how hard he squinted he couldn’t see the pass that his guides claimed that they had found. Turning in his saddle he sternly glanced at the guide, looking for reassurance. To further justify his information the guide turned and spat out a thick stream of brownish mush and retorted, “look sir, I’ve scoured these hills and mountains for most of my life, my information is good there is a pass through there. The Blacks know nothing about it, it’s a back door to their empire.” Valjean looked around at his hardened group of cavalry men. Orders had come down from on high, he would traverse the mountain pass and pillage the Black territories on the backside to hopefully relieve the front lines. The mission was dubious at best, and Valjean wholeheartedly believed he would never again feel the warmth of his Empire’s soil beneath his feet. The Black Imperial Navy prepares for a coastal invasion of the Green Empire. Cold winds blew off the traditionally warm waters of Saint Anitov Bay. An grizzled man stepped out of the run down shack he called home to do his duty as a coastal watchman for the Green Empire. Putting a spyglass to his eye, he let it wander back and forth over the choppy water. Nothing… he didn’t expect anything, his patch of coast remained a quite and tranquil place. Turning back towards his hut an unnatural glint off the water caught his eye. Resigning himself to one last peak through the glass, he could barely make out the mast of a large troop ship. Soon other ships began appearing on the horizon, battleships, cruisers, and worst of all troop transports, no doubt laden with the infernal hordes of the Black Imperial Army. One of the game elements that I appreciate from games like Tigris & Euphrates and Settlers of Catan are their quick look cards. I wanted to do something similar for my game so that players could easily reference how much taxes they should be receiving for their territories, how many victory points they will get for certain structures and achievements, the cost of building structures and units, and perhaps most importantly have a quick and handy chart to mark their victory point progression. This also allowed me to modify the points at which each player is awarded cards. At this point each player replenishes their deck at the end of the round. 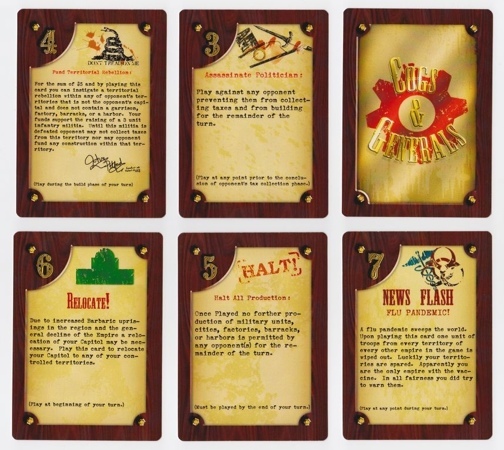 Players are only permitted to play one card per round, outside of cards that they use during battles to boost military performance. Thus far using these card rules has worked out. Obviously this is all subject to change as further play testing is done, and especially once I get the cards updated to reflect the new battle system that has been previously discussed here. With all that said here are the quick guide cards that I’ve made. I tried my hand at adding some symbolic flair to each of the four empires. As always please let me know what you think. I will be updating them as I modify the rules. We have still only played a couple of games using the victory point tally as our marker of victory so no doubt changes to how victory points are handled will be forthcoming. Prefect Galvano looked out across the peaceful waters of Prince Thorne Bay and admired the cannons guarding the port. Almost a century of peace had made the cannons seem like an unnecessary and gaudy accessory to the otherwise pristine visage. But, with the Green and Blue Empires locked in a deadly war just across the waters he feared it would only be a matter of time before the Red Empire would be dragged into their petty conflict. Still he hoped to avoid such a mess and aid his district’s continued peaceful growth. One of my chief goals in creating Cogs & Generals was to create a game that could be won without any bloodshed. Such a victory would not be easy and a strong military would still be necessary to assuage any potential attackers, but I wanted to foster at least the possibility of victory through peace. The goal of the game has always been to create the greatest empire, which is not necessarily always merely the “last empire standing” in a world turned to rubble. I am pleased to say that our last play tested game proved that such a victory was possible. We started a three empire game on the smallest map possible, with each empire starting as island nations. Three small islands begat three small empires. The Black Empire had not forgotten the Blue Empire’s vendetta from the previous game and the two empires were almost immediately at war with one another. Meanwhile I attempted to keep the Red Empire out of the war, slowly building up the infrastructure of my island. I built forts along the coast as a deterrent to would be attackers, but also for the victory points that they granted. I let the other empires waste significant sums of money on large navies while I littered my shorelines with coastal batteries. Eventually, the Black and Blue Empires reached a stalemate, and I was able to win the game through victory points without having fought a single battle. -I am still not content with the way that naval battles play out. A “fleet” represents a significant investment on the part of the player and to see it go down with one dice roll seems anti-climatic. The fortress buried in the mountains blended seamlessly with the surrounding stony landscape. Artillery fire continuously berated the besiegers while soldiers cried out for medics and their comrades continued futile attempts at digging in to unrelenting terrain. General Petrov knew that this assault was futile, but the higher-ups, in their grand wisdom, had decided that the attack must be pressed. They may have made the decision but it was now his sword to fall on. As another barrage of cannon fire shredded a nearby supply wagon in a spray of splinters and the screams of dying horses the once great General laid his head in his hand in sad resignation, this siege signaled the end of his career, his army, and perhaps the once great Green Empire. We recently completed a three empire play test of Cogs & Generals. All and all it was a successful play through. The new battle system works much better, and allowed for quicker play. I was able to achieve victory due to the fact that I created a choke point between my Red Empire and the Green Empire in the north west by building a fortress in the mountains. The Green Empire continuously assaulted this fortress wasting countless infantry without attempting a combined arms approach or simply circumventing the fortress by attempting to land troops behind the front lines via sea. Having closed off the Green Empire’s ability to expand, I was able to focus my remaining funds and efforts on defeating the Black Empire in the South West corner of the map. All in all this was a fairly straightforward game. Here are the issues that I believe need to be addressed moving forward with development. – The cards need to be updated to reflect the new battle mechanics. The numbering system on the cards no longer makes much sense now that up to three d6s are being rolled during each phase of the battle. There you have it, a short battle report. I apologize for the lack of pictures. In light of the recent play testing of Cogs & Generals I realized that my battle system was in dire need of simplification. With that in mind over the last month or so I’ve been racking my brain for a method of simplifying that particular system without absolutely dumbing it down. 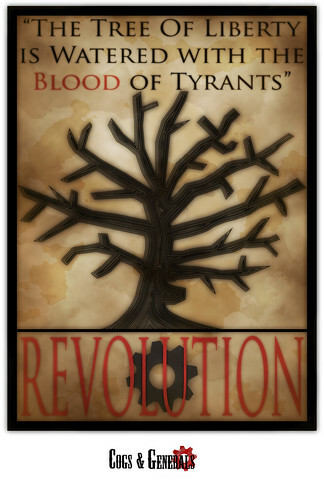 A poster I put together to hopefully draw support for the Colonial Revolutionaries. A couple of nights ago as I was laying in bed pondering this conundrum I believe that the answer has finally come to me. The old system was clunky for several reasons. First, it required the use of up to four dice, with one of those dice being twelve sided. Second, all of the dice needed to be added up, into two separate categories, then combat modifiers would be applied, finally the two sides involved in the conflict would compare their totals to see who won the conflict and how many casualties were taken on either side. If that doesn’t make much sense, do not worry about it, almost nobody could make sense of it which led to significant problems while attempting to play test. The old system made sense in my head and in “theory” but in practice it was a convoluted mess. SO… back to my “revelation”. The new battle system is much more straight forward. You roll one dice per TYPE of unit you have on the field. This permits you to roll up to three six sided dice if you have at least one infantry, one cavalry, and one artillery involved in the battle. If you only have one unit type, no matter how many of that unit you have in conflict you only roll one die. Therefore, even if you have 12 infantry units invading a territory, if they have no artillery or cavalry support they will only be rolling one die per round of battle. Casualties are no longer determined by comparing your roll to your opponent’s, instead you roll for hits. By rolling a 4-6 you have killed an enemy infantry unit. A roll of 5 or 6 is required to eliminate cavalry and artillery. With that the battle system has been simplified. With this change I am forced to update/reexamine my cards, due to the fact that the cards can be used for an in battle die roll bonus. The numbers in the upper left hand corner make no sense in regards to the new battle system. For this reason I’m going to have to update them to reflect this change. I’m hoping that in this process I’ll also be able to improve some of the art on the cards. That’s all for now. I realize that unless you have actually played the game a lot of what is in this post may not make that much sense. But since this is a “web log” of this game creation process I thought that it might be at least a little beneficial to put this out there. If you have thoughts on any of this feel free to toss them my way. Good news! This week I received the cards and money that I had printed using the SuperiorPOD website, and they are beautiful. I am pretty excited by the way these turned out. They look incredibly professional, almost as if they belong in a “real” game. I am not sure if the art design I am currently up using will be final, and to my disappointment I found several spelling errors (my fault not SuperiorPOD’s). But all in all I do not think that I could be any happier with the product. The cards have a sturdy and glossy feel to them, and even though they are not the highest quality paper type that you can get from the site there is no problem with being able to see through the cards. As for the money, due to my design it did not turn out perfectly. A beginner’s error, but an error nonetheless I failed to leave enough of a bleed which led to much of the “cash” that I ordered being sliced imperfectly by SuperiorPOD. However, the money that did slice correctly turned out great. Here’s a scan of a sampling of cards that I received from SuperiorPOD. As always let me know what you think. Over the Christmas holiday I was able to create a vector outline of the hex frame I wanted to use for my game. I have discussed in the past why I believe that having a frame for a tile laying game is important. The primary reason is so that the map stays together in a playable fashion. Lesser factors include creating map cohesion and adding to the aesthetic of the game in whole. I have attempted to create a hex frame using the same method I used in designing and cutting out the hexes. However, this proved problematic due to the fact that I was unable to cut the mat board perfectly enough to ensure that the pieces fit together properly. My solution was to have a company I found in Canada laser cut the hex frame pieces out of wood. I could then stain and poly the wood to give it an old world feel. Of course if I ever get around to actually mass producing this game I would have some chipboard cutting dies manufactured so that these could be mass produced in a more effective manner. With all that said I have received my laser cut pieces and I believe that they turned out spectacularly, and I can not wait to sit down and use them in a game. One of the advantages of having this multi-faceted hex frame is that I will be able to clearly delineate the size of the map I am using for play testing. The size of the map heavily influences the length of time that any given game will last. Here are some pictures of the hex frame. As always let me know what you think. Received the Last Two Empires! A great thing arrived in my mailbox recently, you guessed it, or did you just read the title. Either way my last two imperial armies arrived in the mail. I must say that they turned out amazing. Special thanks go out to Jason at the Dapper Devil. The work that he did was superb. In my personal opinion I think these are my favorite two armies. This might just be due to the fact that I’ve been staring at the Red and Black Empires for the past six months, and these are some new colors and variety. It could also be a reflection of my improvements with vector design. Either way I will let you all be the judge. You may also notice the inclusion of some Yellow Rebel units. These can be placed on the map in any unguarded territory whenever any of the players draw and play a specific “Fund a Revolution” card. Without further ado, here is a gallery of the two new empires for your viewing pleasure. As always please let me know what you think.